Stock up on pasta sauce at a super price. 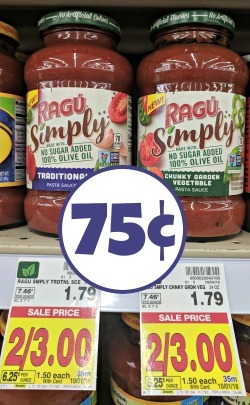 You can get Ragu Simply Pasta Sauce for only 75¢ after coupon at Kroger! -$0.75/1 Ragu Simply Pasta Sauce, 08/26 SS (exp 9/23) [24-oz.] 75¢ after coupon.